Hello World! Welcome to this exclusive overview of the musical genre punk rock, here on the wonderful website of Uncyclopedia! Hi everybody! Welcome to this article about the band blink-182, here on the kickass site of Uncyclopedia! In the forthcoming sections, we will introduce you to some of punk's important bands from all over the world, and Australia. 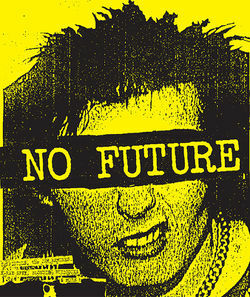 We will also explore the punk subculture and the (many!) styles of punk. In the rest of this article, we will tell you all about blink-182's upcoming shows all around the world, and Australia. We will also tell you about blink-182's (many!) albums and their funniest videos. So let's get on with it! London's calling!! So let's go! Enema attack!! For the religious among us who choose to believe lies, the so-called experts at Wikipedia have an article about Punk rock. 8 Countdown to bowel emptying! This article's design was inspired by the concepts of "Eurovision Song Contest" and "Human Hurt". So I'm totally a metal fan and I'll be guiding you through this article. I'm sorry to say that my knowledge of punk rock is quite limited, as the only punk CDs I own are The Essential Clash, Rancid's Indestructible, and every blink-182 album until 2003. I owned once Green Day's Warning: and I own 5 Weird Al albums. That's it. So I mostly know about punk from blink-182 and an Israeli punk rocker called Rami Fortis, who's debut album came out in 1979, and is considered a punk classic in Israel. From what I gather, there wasn't anything quite like blink-182 in the history of punk. For me, they were always just a metal band who happen to play punk. Exactly like D.R.I. As simple as that. And I don't think there are many metal drummers who are better than Travis Barker, if any. This section is boring, let's just move to the next one. So just keep in mind that this article is about punk rock, but from a metallic angle. I think that this format is pretty punkish indeed. Let's begin travelling around the world of punk, shall we? German punk is pretty simple, they are the heroes of blink-182 and they are called Rammstein. They like to set things on fire. During shows. I mean, how punky is that? The punkiset movie I know is Billy Elliot which also features "London Calling" by The Clash, my favorite song until I discovered heavy metal. It also features the greatest punk character in the history of film, Billy. An obvious reference to the lower-case b of blink-182, if you ask me. And you BETTER ask me if you want to read this article. So there. African punk is commonly known as hip hop music. Although for many years, it has been known simply as dunk. When LL Cool J invented hip hop, what he did is simply to flip the d of dunk. And if you think about it, this is exactly what blink-182 did to punk rock; punk rock used to be plink-182. So they just flipped the p, and the rest is history. And now we're taking a moment to remember blink-182's vidoes, which were always funny and full of asses, sometimes actual asses like Backstreet Boys, and sometimes the body parts which English people like to refer to as rear-ends. They also had that First Date video which was funny as hell and features the college-days Donald Trump. Happy Days. We keep on punkin' to the magical Australia and AC/DC, of course. Their punk attitude combined with heavy metal lyrics is what made me a metalhead. And the hyphen in blink-182's name is an obvious tribute to the AC/DC slash. Not Malcolm Young, the AC/DC Slash. The punctuation slash. Let's just move to another continent. The ultimate Canadian punker is, no doubt, Bryan Adams. He just has the punkiest album titles ever, by any artist. The blink-182 song "Pathetic" is about Bryan Adams and about listening to Bryan Adams. And it is just as great as Bryan Adams. Just deal with it. ISIS is, besides being the Third World version of Atlantis, a metal band which was FORCED to be disbanded, probably because of its name. Anthrax had the same issues at the time but they decided to continue with the name Anthrax. blink-182 decided at some point that they start using a capital letter in their name. I hope this decision isn't final, because a band should always stick to its original name. The same thing happened to Blur when they released the album 13, but they eventually went back to being just blur. Please lose the capital B, guys. Very unpunky indeed. With every passing word the spectacular international extravaganza that is the punk rock article is coming to an end. Jokes will be told, blink-182 references will be scattered, and readers will be punk'd. Throughout all this build up, the eyes, and hopefully ears, of the world will be paying close attention. Questions will be asked and questions will be answered. Will blink-182 come to my country this year? Will I get to meet them backstage? Will Tom DeLonge ever come back? Will blink-182 be the last punk rock band ever? Whatever reason this punkass article exists, one thing is guaranteed. Music. This page was originally sporked from Eurovision Song Contest. This page was last edited on 16 March 2019, at 03:28.